A majority of public affairs professionals believe David Cameron will end up as Prime Minister following the general election, although PRWeek readers believe Labour conducted the best campaign. Those are the results of two separate snap polls undertaken on the eve of the election. The PRCA asked 145 public affairs experts with both in-house and agency roles which party leader they believed would be Prime Minister in one month’s time, following an expected period of political negotiations in the event of a hung Parliament. The poll, conducted yesterday (6 May), found that 61 per cent chose Cameron while 39 per cent went for Labour leader Ed Miliband. PRCA director general Francis Ingham said: "The experts have spoken, and the winner is David Cameron. Tonight will see our members’ wisdom put to the test. "Whatever the actual result, one thing is clear. With politics in its current tumultuous state, good public affairs advice is more important than ever, and that bodes well for our industry." A snap poll of PRWeek readers conducted over the past two days asked which of the seven major parties ran the best campaign. Labour was comfortably ahead with 43.5 per cent of the vote, followed by the Scottish National Party (22.2 per cent) and the Conservatives (18.5 per cent). The Liberal Democrats received 7.4 per cent. UKIP received just 2.8 per cent of the vote, behind the Greens on 5.6 per cent. Plaid Cymru received zero per cent in the survey of 108 people. Meanwhile, a poll of 1,000 UK voters by Edelman found just one in four believe the election campaign has impacted on their voting intentions. Sixty-nine per cent said nothing they heard had any impact, and 53 per cent said the campaign period had not taught voters anything new. However, 69 per cent said they felt more interested in this campaign than they did in 2010, compared with 22 per cent who felt less interested. Despite the rise of social media and internet news sources, the public still favours TV for election coverage, the survey shows. Respondents saw TV news as the most trustworthy (65 per cent) and informative (76 per cent) source of information about the election campaign, ahead of online (63 per cent, 59 per cent) and newspapers (54 per cent, 39 per cent). Twenty-two per cent believed TV changed their voting intentions compared with 17 per cent for online news, 15 per cent for newspapers and 13 per cent for social channels. 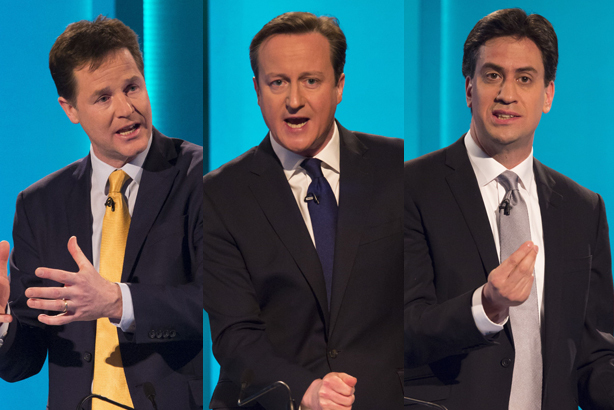 In total 74 per cent of the public found the TV leaders’ debates useful and 81 per cent said they made them more likely to vote in this election. Cameron appears to have been the biggest loser from the debates, with 38 per cent of viewers reporting that they felt less positive about the Prime Minister as a result, compared with only 27 per cent who felt more positive. Elsewhere, negative campaigning appears to have been effective, with 45 per cent claiming that negative messages they heard about a party or a leader made them less likely to vote for them. However, 53 per cent wanted to hear less from celebrities. Meanwhile, 32 per cent of all voters reported that they were following at least one official party source on social media, with Labour the most-followed party across Facebook, Twitter, YouTube and Google+. On Facebook and Twitter in particular Labour enjoyed a huge margin of victory over the Conservatives (Facebook 40 per cent for Labour, 30 per cent Conservative; Twitter 44 per cent for Labour, 29 per cent Conservative). Ed Williams, CEO of Edelman UK, said: "What this shows is that voters do care about party politics but they want more substance, more detail and more leadership than they heard during this election campaign. "Voters are relatively unmoved by the sound and fury of the political pundits or by celebrities shouting from the sidelines. Although they are influenced by negative campaigning, they really want to see politicians take each other on and talk about the issues that matter. "TV remains the most important and influential political medium in Britain and the British public clearly believes that the leader debates are good for our democracy. Candidates who try to avoid them risk missing the opportunity to communicate directly to a mass audience ready to listen..
"On social, Labour’s leadership is likely to be due to a combination of demographics and a new manifestation of the ‘shy Tory’ phenomenon, making Conservative voters less likely to signpost their voting intentions by following party sources." The Edelman survey was conducted from 1 to 3 May.